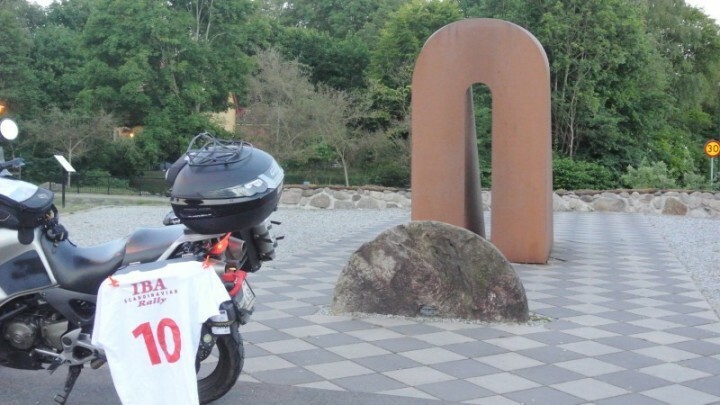 Since this is my first rally I ever done I will try to make a ridereport and also write about what experience and situations I have gone through. The rally started Friday @1800, June 13. 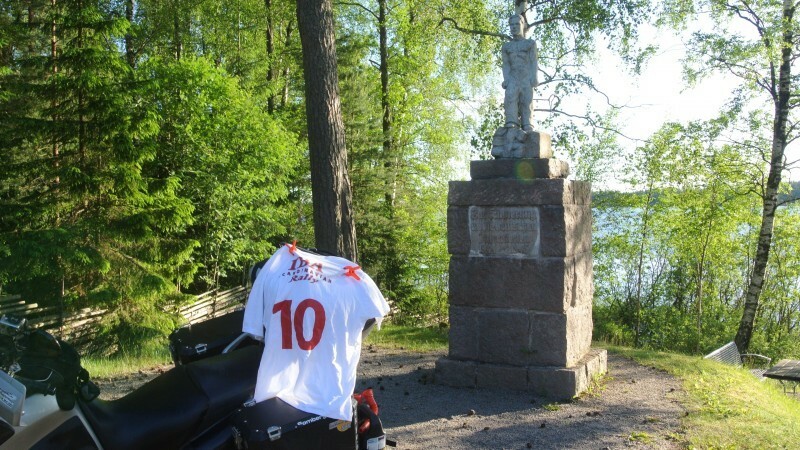 Friday 13th in Sweden is also called the unlucky day. But so far so good, everything worked fine this day. Bike has given trouble the whole spring and have not work when I had try going on a ss2000, that gave an ss1000 that also failed to he ride-to-eat event in Aalborg. Last weekend I travelled to Geiranger in Norway for a international meeting for the Varadero Community. Bike failed on that trip to. So it could be a DNF this start aswell..
Got the coordinates for the rally a little earlier to get them into the laptop and try to get a route using Garmins BaseCamp. What BaseCamp asked when I started it up if I like to update. Ofcourse and when the install was ready basecamp didn’t want to start up again. Consulted google and got information of uninstall and then install it again. Instead of using the Rally-hotell I was hosted by another participant of the Rally, Sture. I could sleep there on an air-madress and using his internet. Then back to Rally base for the riders meeting and the rallybook was given out. There was 103 waypoints to choose from all with different score. Some Combo’s and rest and SMS bonuses to get. 3x half hour extra rest at 500 points each, which could be taken all in one, combinded with the RES rest or random. SMS bonus with 1000 points which was to be sent between 20-21 with startnumber, latest stop and where to which point to go. 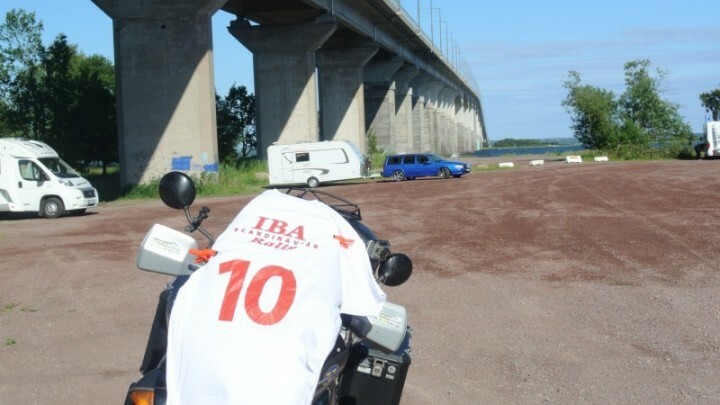 My starting number was number 10, and the rally-flag was a t-shirt. 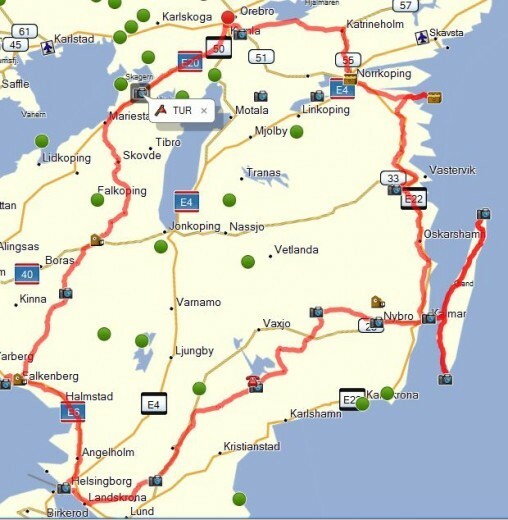 After the meeting we headed back to Sture’s place and started to plan the ride. 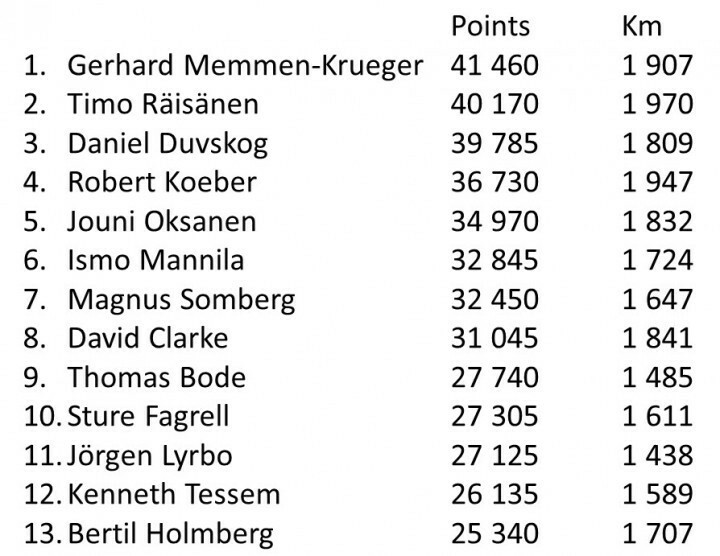 There was some big points in Denmark and Germany and my first plan was to get those. Get into the Stena Line website and found a departure from Frederikshavn 22:30. Problem was that I looked into the fridays timetable when I ordered a ticket and got a call from the Danish office wondering where I were. Answered that I will go tomorrow in same time for departure. Was then told that in saturdays the last ferry leaves harbour 20:15 it gave no more option to cancel the trip and got a refund and do a new plan. Arrived to the startline at 07:00. Bought some coffee and started to get all things working on the bike. My plan was to have a shot in every minute from the ride. Didn’t cover the whole rally. Some troubles with charging cable to the camera so I couldn’t not charge the battery in same time it was on. A timelapse of all pictures will be done and presented later in this site. So here is my planned ride. The story will tell if I ride the plan aswell. Starting to go East from the Rallybase. House with clock, rest bonus. Got out from the Örebro center and down to the first scoring point. A simple fuelstop and got me 150 points. The first points I ever take. Next point was far out east. 3000 points in Tyrislöt. A little camping and canoe rental open only in summertime. 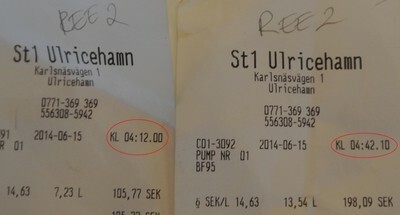 The shopownerness was a harleyrider and I gave a business card to her cause I explained what I was up to and asked if a receipt will show the clock. 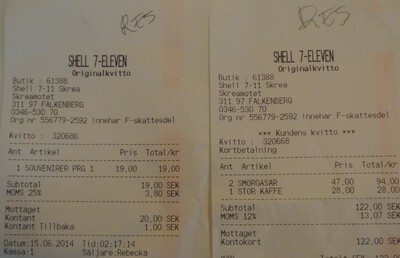 Bought a can of coke for 15 kr and also told her that the IBA is American organisation and a lot of harley riders. It was a little gravel road in the last few meters to the shop but even worse was that some days ago that roadcompany had put tiny small gravel on the road for prevent bleeding asphalt. So it was a very calm ride out there, espically in the corners. Asked the clerk and GPS and what I was told showed me the right way to the next point. Time for the first photo of a rally. 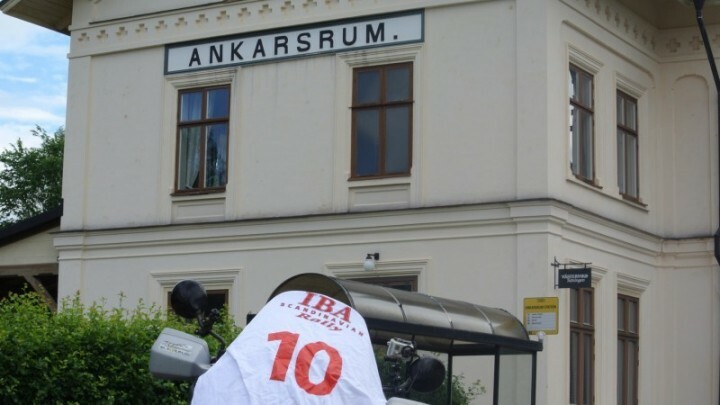 Ankarsrum is a station for a small rail-track and buses since it is a little village. Not so wide as we are used to. Europe has the track width of 1486 cm, This one is probably around 80 cm. From Ankarsrum it was time to get the first lighthouse. Zumo wanted me to take a shorter gravel road and I followed the order. Here the first mistake apperas and I’ve lost 20-25 minutes riding 10 km in each direction. 1 km left to get on the mainroad the gravelroad ended, It wasn’t even a path to ride to. No more gravel rides from a GPS not knowing how the road is. The GPS also had problems to get the speedlimit right. Not simple since swedish goverment recently changed a good road in 90 km/h to be 60-70-80-60-80-60-50-60-70-50 combined with speedcameras everywhere. Well, if speedcamera shoots me there is nothing to be worried about since in just take a picture from front. Reason I will keep inside of the speedlimit is that I don’t want to be part of the statistics that motorcycles just overspeeding. 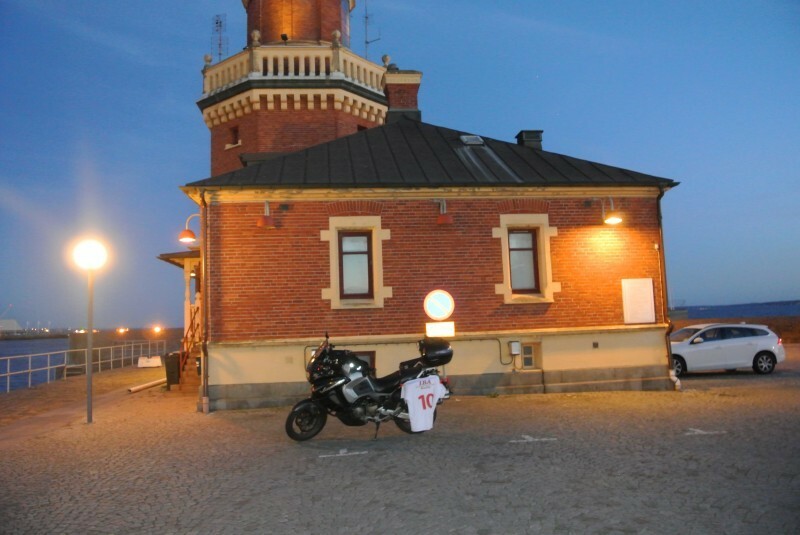 So I was riding south on the E22 to Kalmar. It was time for some fuel again. Varadero is a good bike but fuelcompsumption on this carburettoed version only gives me, depending on RPM’s 270 km to 360 km. At this stage I only did Touch&Go’s. Short stops, filling up and started again. 5 minutes per stop. approx. It had been cold and heavy winds the whole day so far. Entering the Ölandbridge which top is in a higher altitude over open water is not fun to ride a bike to. You never know when a gust will hit you. One mobilehome was so scared driving that he used 2 lanes for his moving home. That upset the rest of the traffic. No one could pass, so most of them used the opposite lane, horning and giving the bird, as they say in TopGun. Was forced to stop and take a 400 meters walk to get the right picture. 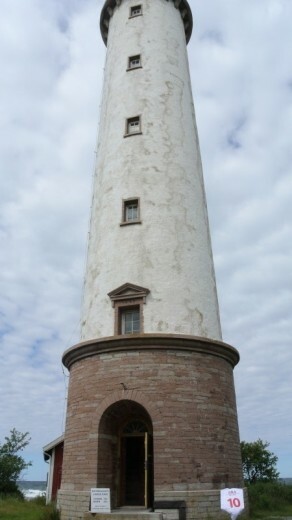 Rallybook claimed that the fundament of the lighthouse should be in the picture. When I walked back to the bike. Cawwa and Sture parked their bikes and we had a little chat. Many of us rookies had choosen to have the combo, just for trying how it works. In the scoring table, Cawwa forgot to claim the combo. It is so easy when you are tired and exhausted that you will forget all those minor things that is worth a lot. How the photo should be and how a SMS will look like. 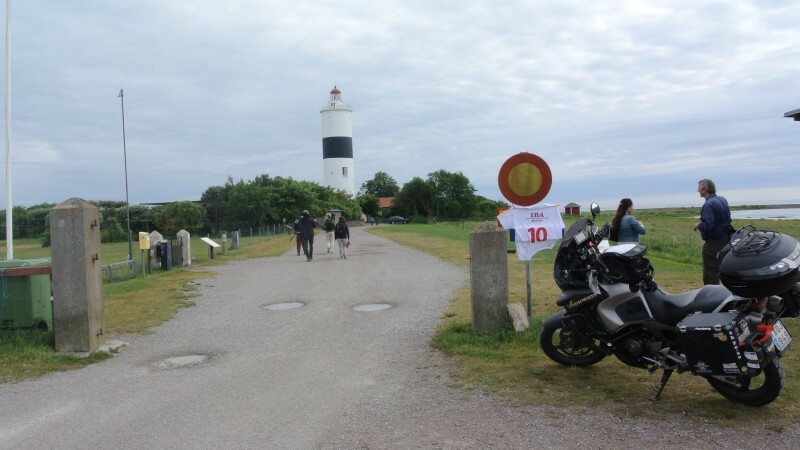 Now it was 150 km directly south for the next lighthouse. Met Benson on his Varadero 10 minutes from the recent bonus. Had to phone the Rallymaster Hampe and told him a little about what was happening on the island. 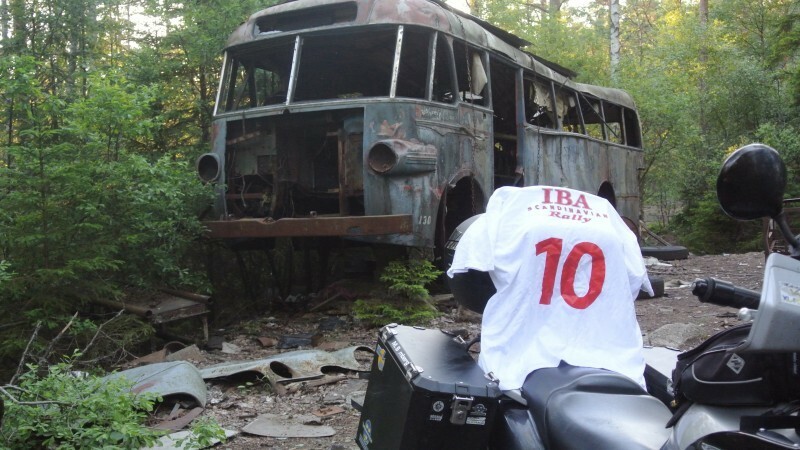 I had borrowed the Swedish IBA spot but it is not so common that everybody has one. Recently Google stop the service using your smartphone with the App Latitude to show the same thing. In the phonecall I told it was 4 bikes going for the combo. Next weekend we have midsummer celebration and this island is crowded with people and vehicles. 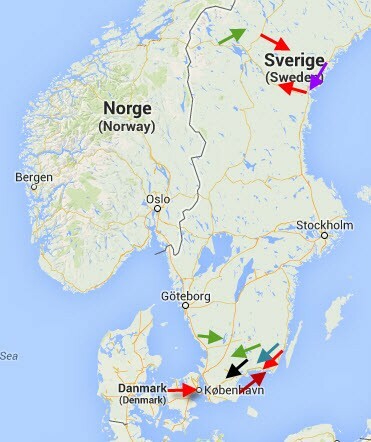 In north you have at least 10 campsites to use and they are all overbooked 100 years ahead. Started to raise my tempo. Since other bikes was catching in, when I minimalized my stops to nothing, it was obvious that Speedlimit was about to put a V.A.T to. To keep my fuelcompsumption down I can get over 4500 RPM’s meaning the top speed was 120 km/h or never get over 30 km/h of the speedlimit to keep my driving license. Going a little faster also give me a more active ride. If it is boring and going slow you will start to thinking of something else than riding and it is easy that an accident will occure. Finally I reaced the south Lighthouse. It is a little weird that all of us claming those locations all started going north and then south. It is the same distance how you ever do them. It is a bit longer from the bridge to the north compared to the going south. It may be psychological to take the boring longer ride first when you are still fresh in the body. The longer you sit in the saddle, you want shorter legs of the route. Took my picture and had a little problem with the bike. Had a misfire and since I had problems with charging I was afraid the problems will start again and the horn didn’t work. So just a few kilometers I stopped for a pee and had look to the wiring to the horn. Negative cable had vibrated off, so I took my pliers and squeezed the contact a little more and fit it back. Horn working again and my blatter had a relief. Next location was a low scoring and if it has been heavy traffic on the island, my plan was to skip this one. I was in phase just 10 minutes of the plan so it was a go and score another 300 points. It was also time for refueling. 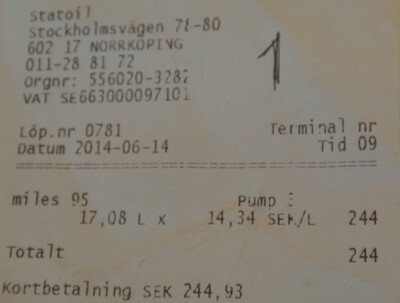 On the bridge fuel light started to lit meaning it is only 5 liters left in the tank. 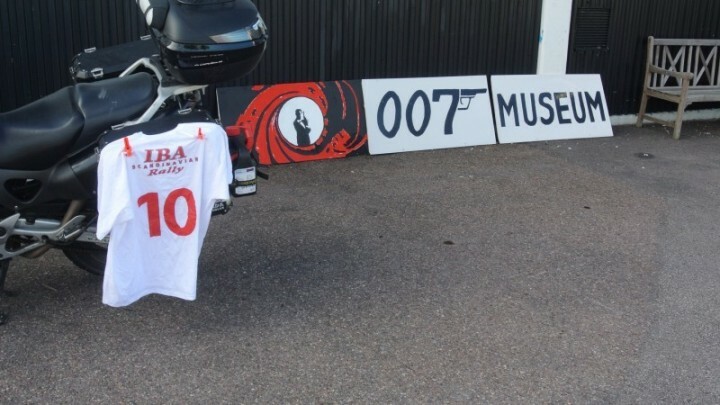 It was 35 km to next bonus of the James Bond museeum and it was in the city of Nybro. 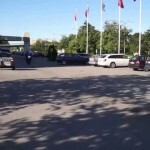 So it will be easy to find a petrolstation. Area of this hood is called ”glasriket” The home of Glass making. Brands like Orrefors, Kosta Boda doing art of glass and chrystal wine glass is well known in the world. Earlier in the day the sign where near the end of the roof. When I arrived, the owner had taken the sign down. Lucky for me it was still there. There was a little combo here. If you had a receipt from enterance the museeum in opening hours between 10-14, you would had 1000 more points. I was forced to take the lighthouses and then go west. Back and forth was not an option but the 500 points was in the right direction. Also here it is time to another explanation of the rally. It can mean that you get a point per kilometer you ride, or a constant of an avarage multiplied with you total kilometers. Time to get to Sandsjön outside Kosta. 1500 valued points of take a photo of this German monument to dead soldiers. Never heard about it before and it was an easy catch. Starting to get aqquinted to my Zumo and in the time of the 43 kilometers ride, I use the option to really zoom into the GPS where the location was. GPS told me to pass with 1300 meter and then ride 1300 meters back when it simply was a left turn to get into the parking lot of this restarea. Next stop was 100 k’s away. I’m into the pace now. kilometers just fly away. Those shorter legs makes it more easy. Passed a lot of villages and small citys I never heard of before. What suprises me is that all names ends with ryd. Had a look of the GPS. Site was located to the left on the road. When passing I only saw a sign told car cementary but no road in to left. Made a u-turn after 500 meters of passing. Waypoint was located of the sign, from there you would follow what sign says. A new experience. Rallybook told that it was a walking point but seeing the that original picture was included with a bike and it was plenty of room for a bike going into the path, I rode the 400 meters and found the bus that had to be shooted. In this point the GPS pointed to the sign and you had to turn right. Sign is in Swedish saying ”Mitt i skåne” Not easy for a foreign driver to follow. Things going real smooth. Took the shot and continued west. Smaller roads had givin me 50 km shorter ride but as Zumo suggested fastes way I contiuned for the full 100 k’s. Near Landskrona highway began and a ride to Helsingborg. Now it is time for climb over 5000 rpm and shorter miles . Speedlimit getting over 120 km/h and 135 km/h is my solution. It is a vortex in the tank, from 0,6 to 1,0 in comsuption. The varadero Work in every road but is a thirsty one. Reached Helsingborg city. Was behind a police car. Signs said traffic into this street not allowed between 22-05 if you don’t have any certain needs. 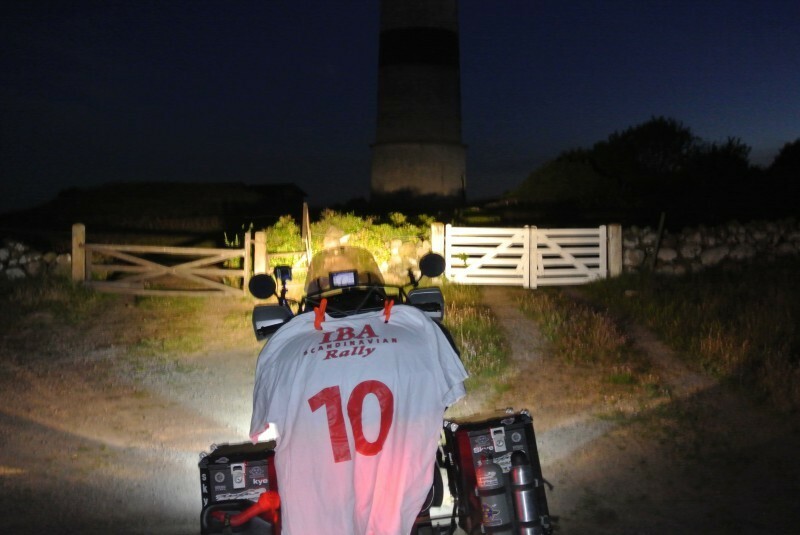 Well taking a phote of the end of lighthouse and bonus is definatly a need. Had the photo and now time to get fuel again. Now it is the time to go for the one hour rest. Here is another mistake that took away valued 30 minutes. There is a lot of gasstations within the Highway E6 but not all of them are open 24/7. I rode to the first stop but it was closed 1 am, so it took me a while to get the other one that was open. When I entered the Shell/7 eleven another biker was there just awaiting bright light. Here is a second business card given away with iba-sweden webadress. Explained what I was up to, how long I had sit in the saddle and what a 24 hours ride is really about. Next leg I’m entering an area where I used to live and also know all about the wild life. It is starting to became dangerous. I’m on backroads, no fences and need brightness. When sitting down eating a sandwich it made me clear that I need to get going. Couldn’t take and use REE. Time was running out, better get going. Get gear on again. Temperature has lowered and we are now in about zero on the scale. It is freezing but dry roads is nothing to worry about. I’m just afraid of wild and animals. My eyes were all over the road. Driving in a real low tempo focused on the pereferi, rather then see what the Zumo tells. I have driven on these roads 1000 times but with car. You are a little bit more exposed when driving a MC in these conditions. Better just to keep it calm. 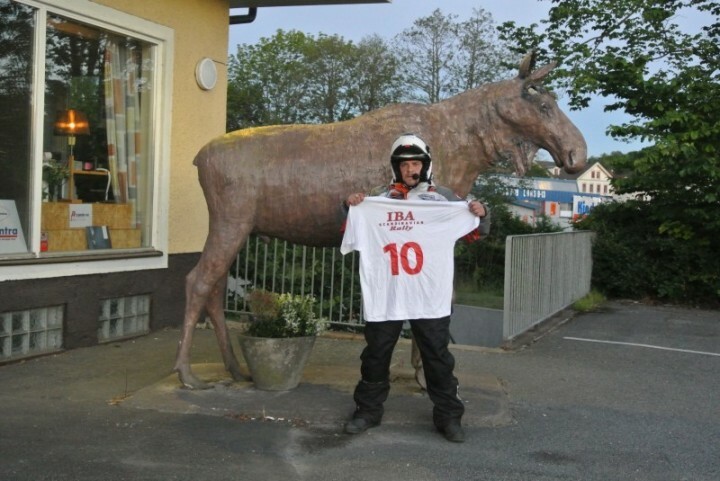 Finally reached the Moose in the roundaboutof the small village of Svenljunga. Get the camera of one of the mounts for the GoPros and shot the picture. 4 hours to pass the finishline, 275 km to ride in wildlife terrain. Or 190 km, rest is guarded with fences. Gps is showing that I will reach Rally base 06:31. Still I have two more REE valued 500 points each. So I need to catch in 7 minutes. 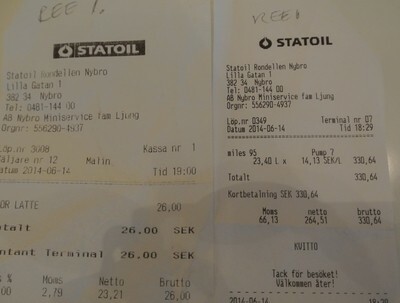 My idea is to get to the rallybase without checking in, Just get two receipts at the hotell. I drove in real so to say rally roads. 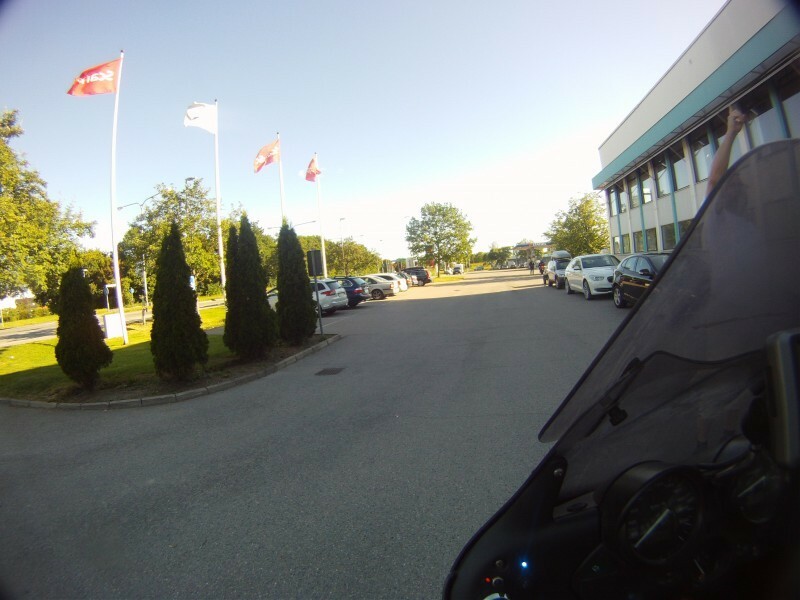 Time for fuel and stopped in Ulricehamn. First station there where out of paper printing receips, so ride another 100 meters to next petrol. I have now been awake for 24 hours but not even sence it. I have yawn two times. One in 11 pm and the other one just now. Took the first receipt, and started to make my own coffee on the gasol kitchen I always carry. 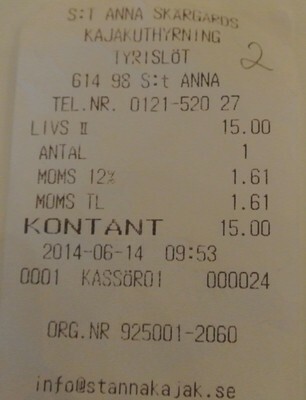 Just fueld a 2 liters to fill it up in the later receipt, I fully needed to have a valued 30 minutes here. Just looking at the receipts tells it all. I used 10 seconds over the 30 minutes. I have now been awake in 24 hours and not feel anykind of tired. Adrenaline kept pumping and still 78 km to the finishline. Arrived to finish 07:10 and the rally is completed. 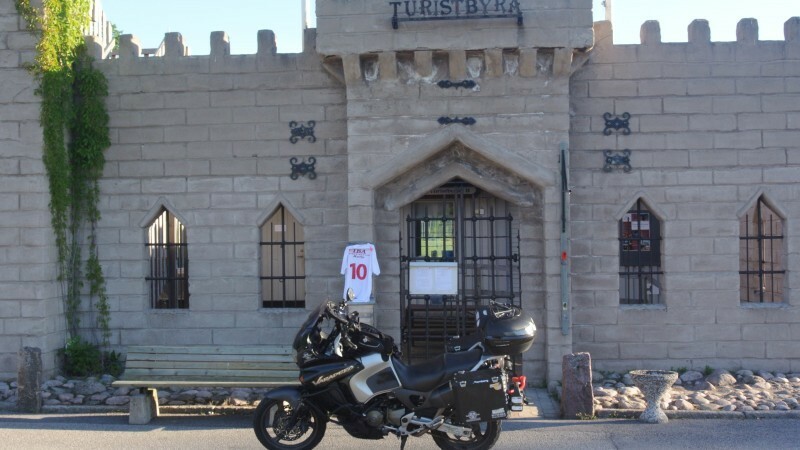 Now it was time to fill in the scorecard, claim the points, showing photos and stay awake another 6 hours with a small ride to Sture’s place, I Thought I would be in the bottom of the scoring. Have ride large legs without scoring. To my surprize I had the 4th score of the PPK and that for a rookie. As a finisher I ended of the 7th spot and the best rookie. Here is the prize cermony and I will update this as soon my videos are out, finally editied. 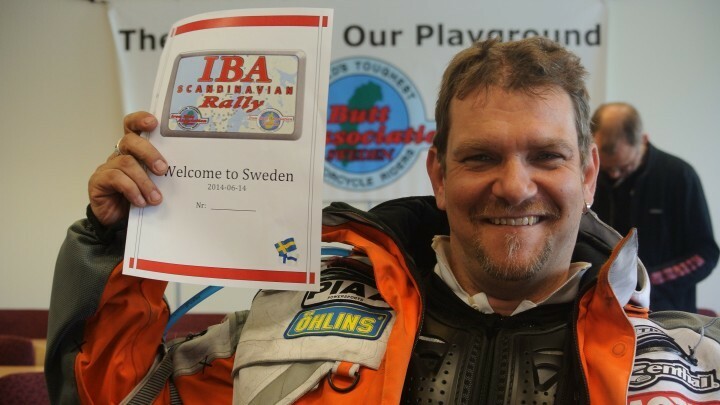 A big fanfare to the rallymasters of this scandinavian rally. Now I now how to plan the next ones.